Problems with the conservation of saiga (or saiga antelope) in Uzbekistan have increased, while attention from the state has decreased. About this tells an open letter from the public representatives of the country to the chairman of the State Committee for Nature Protection (‘Goskompriroda’, since 21 April 2017 - State Committee for Ecology and Environmental Protection) sent on 11 April 2017. There is no answer yet. Last year, the government of Uzbekistan adopted a resolution ‘On measures to streamline issues related to the creation and organisation of integrated (landscape) wildlife preserve.’ The document signed on 22 July 2016 by Prime Minister Shavkat Mirziyoyev provided organisational work on the formation of the ‘Saigachiy’ wildlife reserve. The Cabinet of Ministers accepted the proposal of the State Committee for Nature Protection on the formation of the complex (landscape) ‘Saigachiy’ wildlife reserve in the form of a state conservation institution on the territory of the Muinak and Kungrad districts of Karakalpakstan. But in reality, as the authors of the appeal write diplomatically, the landscape reserve is still not functioning. ‘The situation has been complicated by the fact that in connection with the reorganisation procedures, the ‘Gosbiocontrol’ conservational inspectorate also does not function. The huge natural territory has remained without proper attention and control,’ authors of the letter state. According to one Uzbek ecologist (for security reasons the name is not disclosed), local residents in the saiga habitation for the sake of food and benefit ‘kill everything that flies, walks and creeps.’ But the main object of hunting is still relic antelope. In the Uzbek press infrequently publishes information about the total destruction of saigas. The last time the source of information was not the nature protection department, but the press service of the State Customs Committee for the Fergana region of Uzbekistan. Just prior the publication of the government resolution in media, it was reported that customs officers ‘had found 468 pieces of saiga horns and 72 parts of horns, as well as 170 skins of these animals. The investigation showed that horns and skins intended for illegal exportation outside the country and belong to a resident of the Sokh district.’ The district itself is an exclave, located within the territory of Kyrgyzstan. Smuggled goods of criminal origin were freely delivered to the adjacent territory – at 2000 kilometres from the other end of Uzbekistan. 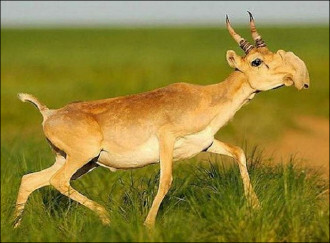 ‘Fergana’ has repeatedly turned to the topic of preserving the saiga population in Uzbekistan. Back in 2006, the representative of the State Committee for Nature Protection had risked to respond to the next material of our publication and had received a corresponding answer from the journalist. Since that moment the situation has worsened, and Uzbek officials have refused to make public comments, but two years later saiga was listed in the national Red Book. The authors of the letter ask the question ‘how soon the reserve will start functioning in the required conservation regime.’ It seems, never. Uzbekistan is not inclined to fulfil international obligations, or to comply with its own legislation. But with pleasure, replaces the real concern for the rescue of relic animals with formal support for propaganda activities: for example, on 1 May 2017 in Nukus, Karakalpakstan enthusiasts planned to hold an ecological ‘In Defence of Saiga Antelope’ marathon. Meanwhile, the State Committee for Nature Protection was transformed into the State Committee for Ecology and Environmental Protection. Bakhtiyar Abdusamatov became hokim (head of administration) of the Yunusabad district of Tashkent. There is the Botanical Garden of the capital in its territory, in which barbarous felling of trees is recorded, which the former head of the committee also ignored. While in Uzbekistan there is a government reshuffle, Uzbek ecologists speak about a catastrophic decrease in the number of the Ustyurt saiga population. There were more than two million saigas in the middle of the last century. Over the past ten years, according to air reconnaissance of Kazakhstani colleagues, the saiga population has decreased from 17,800 to 1,900 heads. In 2017, scientists did not see saigas in the country at all. Part of the border with Kazakhstan is equipped with a metal grid with aisles for saigas. Poachers are now just waiting for saigas by the aisles and mercilessly killing animals.